Toshiba on Tuesday announced its new hard drives featuring 12 TB and 14 TB capacity aimed at NAS and desktop applications. The HDDs are currently sampling to Toshiba’s partners and will hit the market a bit later this year. 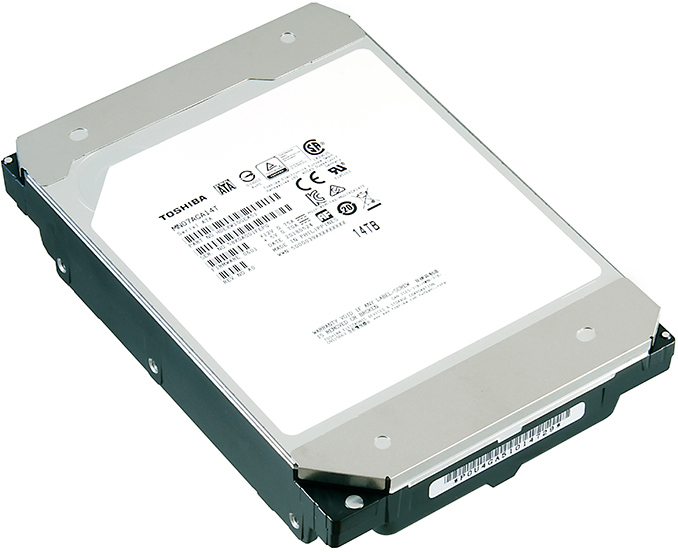 Toshiba’a MN07-series hard drives resemble the company's MG07 enterprise-grade helium-filled HDDs introduced late last year. Both MN07 and MG07 hard drives are based on eight or nine PMR platters from Showa Denko with ~1.56 TB capacity per platter. The new hard drives feature a 7200 RPM spindle speed, a 256 MB cache buffer, and use a SATA 6 Gbps interface. Like other HDDs for NAS applications, Toshiba’s MN07 come with NAS-optimized firmware and support an RV compensation technology to guarantee predictable performance in multi-drive environments. Meanwhile, unlike the enterprise MG07-series, the MN-series HDDs are rated for 180 TB per year workloads and 1 million-hour MTTF, but they do not offer various features that guarantee enterprise-grade durability and reliability (e.g., persistent write cache (PWC) with power loss protection (PLP) technology, etc.). Toshiba said that it started sampling of its MN07-series 12 TB and 14 TB HDDs on Tuesday. The company did not name companies that will use it for their NAS offerings, but it is natural to expect various leading NAS makers to use the new drives in the coming months. One important thing to note about NAS HDDs in general is that they tend to show up in retail eventually, so, it is highly likely that Toshiba’s MN07-series hard drives will be available for purchase from stores like Amazon later this year. Why do we stick with 3.5" Hard disks? One thing I simply don't get is why HDD manufacturers are still sticking to the 3.5" disk format. I mean, let's face it - spinning rust lost the speed race to SSDs years ago. It's main and key advantage is capacity/price, which SSDs simply can't touch, and probably won't for a while. I don't buy drives like these 10 TB here for speed, but because they offer a lot of cheap space. And, we all know - there is no such thing as too much storage space, at least in the digital world. So, why not go back to, let's say, 5.25 inch format platters, which offer an ~ 80% larger area (3.5 inch disks are actually a bit over 3.7 inches, and 5.25 disks are about 5.1 inch in diameter). These larger disk platters fell into disfavor due to higher loads on the motors and spindles, worse thermals, and more limited speed many years ago, BUT, that was long before we had current disk materials and He-filled drives that enable thinner, lighter disks and reduced friction, and before SSDs came along, which are just so much faster than any spinning disk drive . Plus, current bays for 3.5 inch drives (except laptops) are 5.25 inch bays, after all, so a 5.25" drive would fit in my existing racks or NASs. >Plus, current bays for 3.5 inch drives (except laptops) are 5.25 inch bays, after all, so a 5.25" drive would fit in my existing racks or NASs. They are not and the don't. Lots of Rack are now specifically designed for 3.5". Look at the ones used by Dropbox and Blackblaze. This question has been answered multiple times, and the answer is rather simple. They have their production line all tuned for 3.5" already. Not just the HDD manufacture, but heads, strokes, platter, finishing, assembly. 5.25" equipment are long gone. And HDD unit sales are falling. They have production capacity to fill, making larger HDD where customers buy less HDD are not in their interest. Both WD and Seagate are on track to sell HALF the HDD unit from their peak shipment sometimes in the next 2-3 years. And without using something stupid like laser to heat up platter ( HAMR ), Western Digital has MAMR that can do up to 40 or 50TB per HDD. As strange as this may sound there are still close to 80M PC shipping with HDD by default. From a total of less than 400M Unit HDD shipment. I.e One Fifth of this Market will be gone once QLC, 3D QLC start produce in mass or cheap enough. The cost of building a QLC 128GB SSD will be lower than what ever capacity HDD. Another point, if you look at Blackbaze, Nearly half of their drives are still with 4TB, imagine a year from now, they swapped this for 12TB drive, they would have more than double their total capacity ( 150% increase ) without adding a single rack. Yes, Backblaze, Dropbox and others that use customized storage "pods" have standardized their units for the 3.5" drives without the adapter/caddy that make them fit 5.25" bays, but that could change if another format offers a much better price/space ratio. Backblaze custom designs and makes their pods, and their plans are available for free at their site. Lastly, larger capacity and alternative format HDDs was and apparently still is on the wish list of companies like Google and others mass consumers of bulk and especially cold storage, and Google specifically mentions platter size as one possible venue to increase capacity. I know that the manufacturers are mainly investing in SSDs, and most are reducing their HDD manufacturing. However, I disagree that all consumers are moving to SSDs exclusively. I know my mediaplex server is not the only one that will continue on HDDs for quite a while, simply due to the need for space and the $ or Euro per TB cost, and many rack servers are using 5.25" bays, so there is that market also. Also, just because a market isn't growing in leaps and bounds anymore doesn't mean that companies cannot make good money by being the first out of the gate with more TB per $ or Euro. So, I would still like to hear from HDD manufacturers if they have even considered adding 5.25" (really 5.08") platters back into mix. Within the same technology (PMR or higher density solution such as microwave assist or laser heat), HDD capacity is always directly dependent on platter area. Most consumers don't have Mediaplex server. It is the same reason why a 5 to 10% drop in Mobile Shipment has shift the NAND price down 20%. Consumer market are HUGE. And it is a recurring revenue. The NAND market will now need to fill 200M Smartphone Storage capacity, even if you assume 64GB average, that is 12 500 PetaBytes, or 12.5 Exabytes in NAND. That is more then the total storage of Azure + AWS + Googe Cloud + Facebook Combined. in NAND. I.e No HDD manufacture are willing to invest in it, bring lower price / GB are not their objective. They want to milk the market for as long as they could. They will need someone willing to say they need 20M Unit yearly before they make a move. I'm tired of hearing about > 10 TB 3'5 drives . What about the neglected 2'5 drives for laptops ? We're still stuck with WD 2 TB 15mm height drives (with a big price premium) or the shingled crap from Seagate. If they can make 14 TB 3'5 drives ... shouldn't there be 2-4 TB 2'5 drives (not shingled!!) at 9.5 and 15 mm high ?